This was my first torte, and according to my coworkers, it was delicious! In fact, one of the executives even called it wicked. As for me? Well, I don’t even like mousse-y type stuff and even I thought it was pretty good. Yes, I have a thing with textures and food. I’m weird like that. Anyway, while this was easy to make, I found it quite time consuming. Lots of chopping and cleaning up Oreo cookie crumbs–oh wait, that was just me? The end result however, was magnificant. Everyone kept walking by asking if I really made it and said it was almost too pretty to eat. I made a few modifications to the original recipe by omitting the coffee and nutmeg (hate hate hate nutmeg), and I used at least 30 Oreos for the crust. Other than that, I followed everything else. Photos of the process here. When the ganache is firm, remove the sides of the Springform pan; it’s easiest to warm the pan with a hairdryer, and then remove the sides, but you can also wrap a kitchen towel dampened with hot water around the pan and leave it there for 10 seconds. Refrigerate until ready to serve. Great torte and I love the thumbnail process pictures! I also take my Dorie productions to work – it’s good to see how appreciated they are. You’re right, this does look like an extreme undertaking. 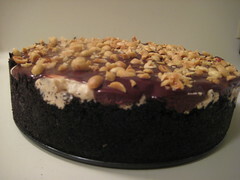 But that picture alone makes me want to test my skills at torte-making! Your pics are always so good! Very pretty! I agree with Rebecca – this is a total excuse to fatten up our coworkers! I often send TWD recipes to work with Jamison to share. Your torte looks fabulous! yum, it looks beautiful! the 24 oreos were definitely not enough, next time i’ll know to use more! Beautiful pie! You fatten your co-workers I am getting my neighbors! Congrats on your first torte! It looks beautiful. I also had issues with the oreo crust being too thin, but unlike you, I didn’t even bother adding more….wish I had. Yours looks great! bet you were employee of the day (or maybe even month) for that! looks good! I only made half so my co-workers missed this one but I am sure yours enjoyed it. Looks great! Don’t you love it when they ask if you really made it? Yours looks so tasty! Great looking torte! you must be so popular at work!! Looks great, and I wish I’d used more Oreos. Your crust is so tall and lovely! Mmmmm, it looks delish! I like the in process photos, makes me feel like I was there. I made this Monday for my Dad’s 72nd birthday. It turned out wonderful and everyone raved about it! We could not stop eating this! Highly addictive and wonderful recipe. Thanks so much for sharing!!!! Just finished making this… You’re right about the mess… Lots of chopping and splatter… but Yummm… I cant stop licking the bowl.. I cant wait to dress it tomorrow. I’m bringing it to my boyfriends work for Valentines Day.. I’m so excited about all the raves I’m about to recieve!! Thanks for the sharing this!